Virgin TV customers to get Sky Sports Formula 1 channel – but not in HD | What Hi-Fi? 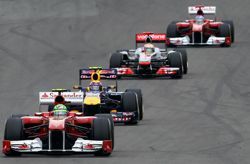 Virgin Media has announced that the Sky Sports Formula 1 channel will be available to its Virgin TV customers. The new channel, launching in March in time for the new F1 season and dedicated solely to Sky's Formula 1 coverage, will show all 20 races live. The channel will be added to the complete Sky Sports package available on Virgin Media, alongside Sports 1, 2, 3 and 4, so Virgin customers will need to subscribe to the Sky Sports package to get the F1 channel. However, the HD version of the channel will not be available from launch.